On the southern and western foothills of Mt Elgon in Mbale district, about 360 kilometers east of Kampala, live the Bagisu/Bamasaaba who, for centuries, have held this mountain as the pillar of their existence. According to Andrew Wandibah, a Mugisu living in Kampala, it is believed that from a hole in Mt Masaba (as the Bagisu prefer to call Mt.Elgon), originated the Gishu ancestors Mundu and Sera. Their origin is not very clear but historians relate them to the Bakusu of Kenya from whom they might have separated in the 19th century due to land pressures. They are, however known to be of Bantu descent. They are also believed to have first occupied the Uasin Gishu plateau in Kenya before moving westwards in the 16th century. 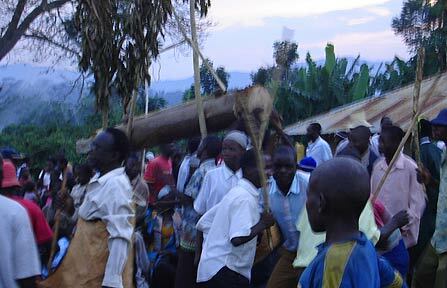 The Gishu culture is probably one of the most notable in Uganda, its major highlight being the kuukaala impaalu (male initiation into manhood by way of circumcision), which takes place in the August of every leap year. The actual origin of this ritual is a mystery, even among the Bagisu themselves. One legend asserts that it originated from the Bapa (Kalenjin) when Masaba, a Gishu hero and ancestor, wanted to marry a Kalenjin girl. He had to be circumcised as a pre-condition and being their hero, his admirers took to it too. Others say, however, that he had complications with his sexual organs, which were healed after circumcision. They thereby assert that the practice started as a surgical operation. Yet another legend says that as punishment for seducing other men's wives, the Gisu elders decided to half-castrate him. However, when he healed, a rumour went around to the effect that he had become sexually excellent afterwards, tempting other men to under go the process so as to compete favorably in sexual matters. The male initiation exercise starts with a convergence of all potential candidates above the age of ten at Mudodo or Mutoto, the former palace of the Umuyinga (the Gisu king) in Mbale town. According to Lydia Nabukwasi, apart from being a tribute to their fore fathers, it is also widely believed that everything begins from here. Bagisu dancing to inemba tunes. Bagisu dancing to inemba tunes. Members of the Gisu Parliament, the candidates, family members, surgeons and well-wishers from all over Bugisu indulge in the kadodi (indigenous dance) to local songs accompanied with drumming until dawn. It is always a celebration of unity and mass circumcision is performed, which marks the beginning of a month long exercise. On the morning of circumcision, malwa (local brew) and konzoa (plantains) are prepared for the candidates and the meal is served at six in the morning. Only men prepare this meal and the konzoa is peeled using fingers, not knives. Smeared with mud, yeast, cassava flour or cow dung, the dancing candidate is led around the village, visiting relatives to raise money for his upkeep. This may last as long as a week depending on the number of relatives he wishes to visit. For morale boosting, umwanaa wipaalu (the candidate) sings as well-wishers respond with choruses. An herb called irianyi for arousal is administered to him. Tied against his big toe or placed in such a place where he might jump over it unawares, the irianyi is believed to highly stimulate him so that if anything affects his concentration, he will end up stimulating himself because irianyi makes his mind so focused to on circumcision that no other thing can distract him. Kuukaala impaalu (circumcision) is a pretty fast operation. The surgeon and his assistant (who must both be registered and qualified) walk around the candidate, performing the required rituals and are obliged to make the operation or else their property is confiscated and severe beatings follow compensation claims from the victim (candidate). The candidate is handed stones or a stick to hold up, in a show of endurance and the ability to stand firm with humility in the face of pain. In the past, the operation used to be performed in an enclosure with only surgeons and the candidate in attendance. Not any more, it is now done in public. Without sterilizing his instrument, the assistant holds the foreskin and the surgeon cuts the first layer. Then another layer (which is believed to develop into another fore skin if left) is cut. Next, a certain muscle is also cut and with these three steps, the ritual is complete. The candidate is applauded and offered gifts such as cows, land and money for standing firm and not breaking down. If he falls or cries, his father's property is confiscated as punishment. The surgeons are keen on using different knives on different candidates to avoid contamination and disease transmission. After circumcision, the candidate sits on a stool, is wrapped with a piece of cloth, taken to his father's house, and made to walk around it before entering. This, says Andrew Wasaka, a student of history at Makerere University, is to make sure that there are no enemies in the vicinity since he is now close to being a man. For three days, the candidate is fed without him touching the food because he is not yet fully initiated into manhood. The surgeon is then invited to perform the ritual of washing the candidate's hands. Our candidate is now declared a man. The initiated young man is, after this point, allowed to marry and is instructed on the duties of manhood, with emphasis on the importance of agriculture. He is also advised to behave like a man. The healing time is believed to depend on the number of goats that were slaughtered during his initiation but afterwards, he has the right to sleep with any unmarried woman in order to test his manhood. If a woman refuses to sleep with a newly initiated man, it is believed that she will never produce children even when married. 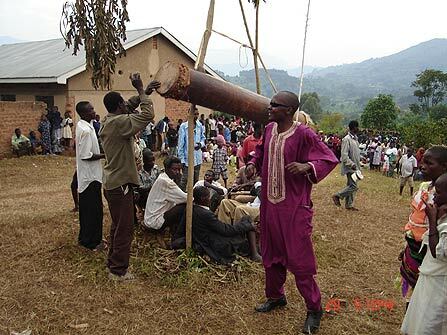 After the young man has healed, a ceremony called inemba is performed where all candidates from a given village/town gather to celebrate their recent achievement. All people, including any government officials attend. Absconders are hunted down and forcefully and scornfully subjected to the ordeal. Indeed, a story has been told of an honorable Member of Parliament who was tricked into going for a meeting, only to end up being circumcised right there. Moreover, with surgeons keeping records of those circumcised, there is no way one can escape. When asked whether the ritual has no violent effects on the children, Lydia Nabukwasi intimates that children are sensitised and motivated at an early age, so they grow up eager for the process, although affluent parents tend to save their kids from the pain by taking them to specialist hospitals for the operation. This though, is an exhibition of their loyalty to Gisu tradition in the face of modern medical procedures. Though many people, including President Museveni of Uganda, have raised concerns about this practice citing the risk of impaalu candidates acquiring HIV from contaminated knives, this practice is considered by the Bagisu to be above the law and that no one has the right to question its sanctity. Even Pentecostal Christians, who consider this process barbaric, are subjected to the knife, although they are exempted from the other rituals. The Muslims on the other hand are always exempted, since they are always circumcised at an early age. This however was a subject of contention within the conservative Bagisu in the past, who argued that since they are circumcised at a younger age, Muslim young men fall short of the real test of endurance, which is the point of male initiation in Gisu culture. Amid merrymaking on the foothills of Mt.Elgon, impaalu candidates wait to become men. Joseph Mwambu, a proud Mugisu says that this masculine and considerably violent process of male initiation is a key attribute to adult male identity in Bugisu. "Apart from making a boy a real man, it is a legacy from our fore fathers, which we must keep going," he adds while priding himself in the belief that circumcised men are more hygienic than their uncircumcised collegues. Lydia Nabukwasi, who is a mother of two, observes that circumcision is associated with sexual supremacy in males but is quick to remark that most Gisu women do not care whether a man is circumcised or not. While the non-Bagisu may consider this practice barbaric and violent, the Gisu youth are always eager to go through with it and few think of absconding. Andrew Wasaka intimates that surprisingly, the majority do it out of good will and not because they risk being punished! Such is the moral and cultural conviction the Gisu have, that most of them think impaalu is eternal. "It is a ritual that I envision growing bigger, better, smarter and stronger, with a possibility of outliving humanity," concludes Andrew Wasaka.